WARNING: This product can expose you to chemicals including ethylene oxide, which is known to the State of California to cause cancer and birth defects or other reproductive harm. For more information go to www.P65Warnings.ca.gov. Managing water in medium to coarse soils can be a challenge. Lack of available water can negatively affect crop establishment, yield and quality, as well as the performance of plant nutrients and soil applied chemistries. To address these issues, growers often increase the amount of water applied to the crop, reducing their return on investment. 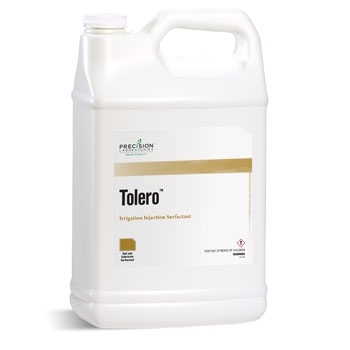 Tolero is a unique formulation of a surfactant that reduces the surface tension of irrigation water and a surfactant that holds plant-available water. This combination of surfactants allows Tolero to improve the movement of water into and throughout the soil while holding water for the plant to use during periods of drought.